Many tales have been told of boxers who have risen up against the odds to achieve success in their lives. None, however, has been as dramatic and had such a profoundly inspirational influence on the people who shared the dream as the true life story of the man they call The Rose of Soweto. 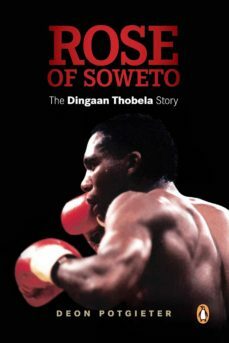 Dingaan Thobela, The Rose of Soweto, has been described as the most naturally talented boxer ever to come out of South Africa. Growing up in Chiawelo under the watchful eye of his grandmother, this is the story of how a skinny boy from Soweto overcame adversity to become one of the greatest boxers to lace up a pair of gloves. Starting his career as a raw 17-year-old with a passion for boxing, Dingaan Thobela would go on to become a two-time lightweight world champion by the age of 26. Fame and fortune followed, but the fairy tale that his life had become was not to last. After relinquishing his WBO title and losing his WBA title, he was to endure seven years of mixed fortunes and bitter disappointments until he found himself on the verge of being consigned to history books. Written off in the media and no longer able to make the weight to fight in the lightweight division, it looked as if The Rose of Soweto had no other option but to fade away quietly. His long-held dream of winning a third world title seemed an impossible one. Yet, Dingaan refused to give it up. He would not be denied. This is the story of how one man went about proving that no matter where you come from, no matter what your background and social standing you can triumph in the face of adversity. And then he proved it all over again. In doing so he would not only regain his crown as the champion of the people and once again be hailed as a unifying symbol in a racially divided nation, but he would also confirm his place alongside the greatest stars that boxing has ever produced.